AKIPRESS.COM - The first private regional university in Tajikistan was inaugurated by President Emomali Rahmon on September 14. 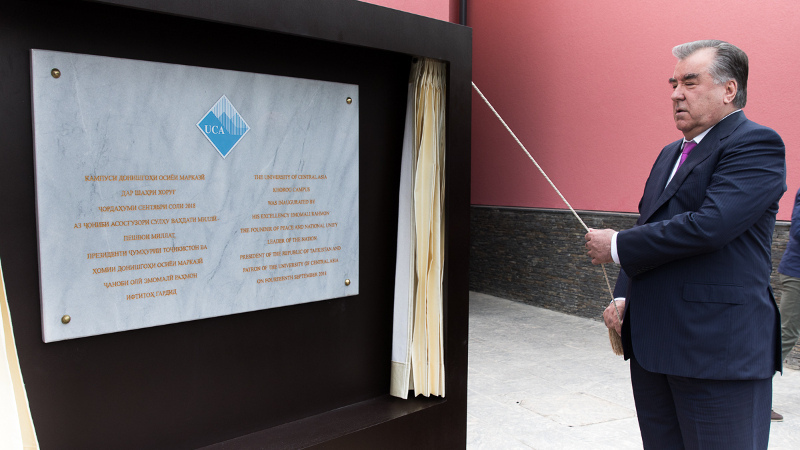 The formal opening of the University of Central Asia’s Khorog campus is another historic milestone, and the second campus to go into operation since its Naryn campus was inaugurated in Kyrgyzstan in 2016, UCA said. The architectural design of the master plan of UCA was prepared by the award-winning Japanese architect Arata Isozaki. The buildings on the campus represent only its first phase, and were constructed mainly by small and medium size Tajik contractors to ensure maximum economic benefit for the local and regional economy. The investment of US $95 million in the Khorog campus was provided by the Aga Khan Development Network, supplemented by a soft loan from the Overseas Private Investment Corporation of the United States. In the first phase of campus construction, UCA operations created more than 1,400 jobs in Tajikistan and Kyrgyzstan, with 90% being local residents. The University also created over 200 permanent new faculty and staff jobs in Naryn and Khorog. In Khorog, UCA has paved roads to Dasht Village from the main town, a gravel road to Upper Dasht Village and an access road from the community of Khitjd. The University also installed streetlights in the area. To extend quality healthcare services to the Khorog community, the Aga Khan Development Network’s Khorog Medical Centre is also under development. In addition, two kindergartens and a training centre for early childhood educators has also been established.